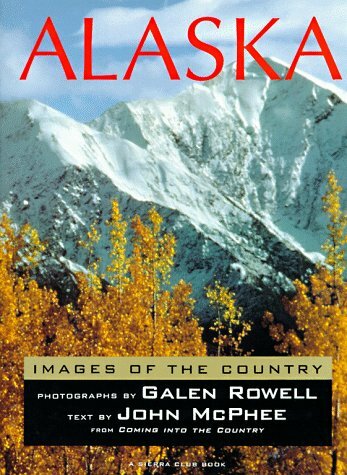 Home Galen Rowell & John McPhee ALASKA: Images of the Country. ALASKA: Images of the Country. Title: ALASKA: Images of the Country. Publisher: San Francisco: Sierra Club, 1981. This compelling portrait of modern Alaska pairs excerpts from John McPhee's classic, Coming Into the Country, with the incomparable images of wilderness photojournalist Galen Rowell. Chosen from more than 10,000 images taken by Rowell on nine separate expeditions to the Yukon State, the 112 full-color photographs featured here seamlessly complement McPhee's vivid prose. Together, text and images capture the overwhelming beauty and variety of America's last frontier - from the rapidly expanding city of Anchorage to the heights of Mount McKinley to the vast expanses of Alaska's frozen tundra. McPhee's text includes profiles of a diverse collection of Alaska residents, providing fascinating glimpses of the people who thrive in the desolation and freedom of the Arctic: the self-proclaimed "weird characters" inhabiting the remote town of Eagle; 114-year-old Liza Malcolm, whose only language is an Indian tongue understood by less than a dozen living people; and violinist Frances Randall, who practices while working at a landing site on the Kahiltna Glacier. This classic book offers readers an incomparable portrait of the complex and dramatically beautiful land that is Alaska. Indeed, as the Conservationist declared, "For those who have longed for years to visit America's last frontier, the purchase price of the book may be the least expense incurred in furthering a deep and abiding interest."